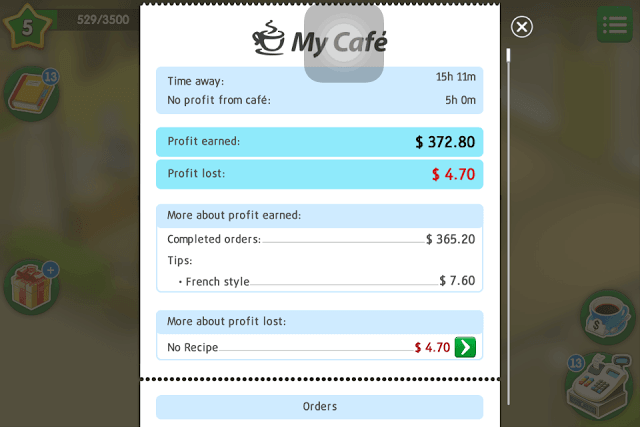 Melsoft Games’ My Café: Recipes and Stories is probably the most challenging restaurant sim game I have ever played. Making money is quite tough, so is attracting customers. 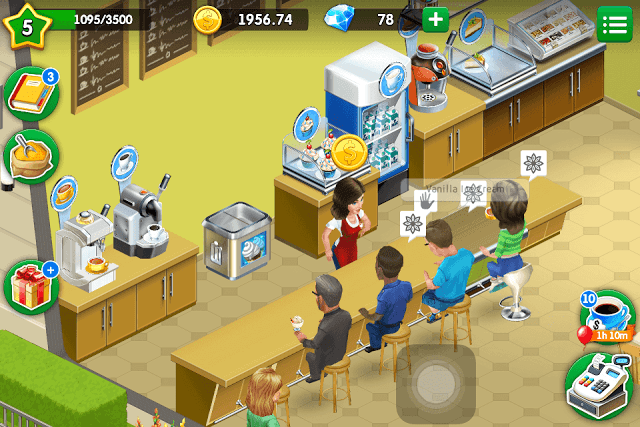 You will start slow, placing tables and stools and buying equipment, but once new customers and features are unlocked, you will be addicted to this game. One gameplay feature I liked the most is the inclusion of fun stories and gossip to a restaurant sim game. Each customer has its own story to tell and Ann will be a part of that story, helping them overcome their challenges. Some stories are quests and completing them will earn you handsome rewards. While Ann and other employees will do their best to serve the required orders to all customers, you can lend a hand to them and serve customers yourself. Just tap a customer and press the “What would you like to order” button. Note down the orders and start preparing drinks and other items yourself. If you forget a recipe, just tap the tea cup icon at the bottom-right corner of the screen to access recipe list. Once the order is ready, tap the same customer and press the “Here’s your order!” button to serve him. Doing this will let you serve all customers quickly. You can do this when there are too many customers arriving at your café. Help Ann and employees serve orders faster by tapping machines to make drinks. Employees will have to wait for a machine to make a drink, so why don’t you tap them first before they do to help them serve customers faster. While they are busy serving customers, tap empty machines to make drinks for future customers. It will take a few seconds to make a drink. Make sure all machines are not empty and tap a machine as soon as it becomes empty. When Ann levels up, an up arrow icon appears above her head. 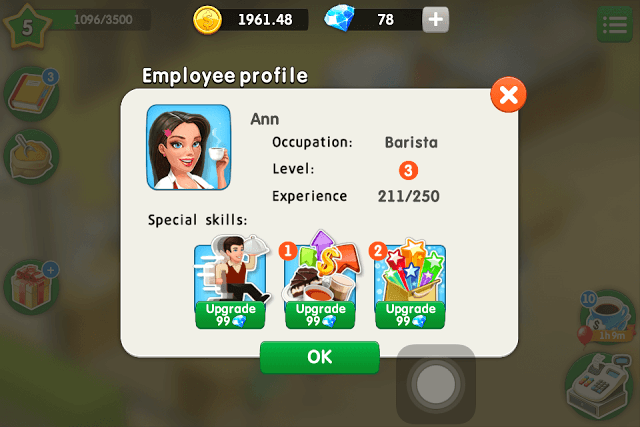 Tap Ann and then tap the “Tell Me about Your Skills” button to know her current level and the available skills. Ann possesses 3 main types of skills – DailySimpleGift, AllItemsPrices and Speed. Other staff members may possess different skills so you will need to read their skills by tapping their skill icons and upgrade the best of three to get maximum profits. When an employee levels up, you can upgrade a skill of your choice, but you can only upgrade one of 3 skills. Choose your skills wisely. I would recommend upgrading Ann’s “AllItemsPrices!” skill as upgrading it will raise the price of all items by a certain percentage. If you have upgraded it to level 1, then all item prices will be increased by 6 percent. At level 5 skill, item prices can be raised by 20 percent and at level 10 skill items can be raised by 30 percent. Once you have upgraded “AllItemsPrices”, tap the tea cup icon to set new prices for all unlocked items. You will now see that previous prices are in light green color. Tap the plus button to increase their prices and stop when the color changes to dark green. Beyond that the color will change to yellow and very few customers will order those items that are in the yellow color range. Your second priority should be to upgrade Ann’s “Daily Simple Gift”. Upgrading it to level 1 will give a simple gift every day, whereas upgrading this skill at level 5 will give you 2 gifts and at level 10 will give you 3 gifts. Simple gifts may contain spices, which you can infuse into drinks and serve them to your customers at a very high price. Having an extra server will speed up staff and help you earn more profit. Every time your café levels up, a new customer will arrive at your place. When you are not playing, the new server will help Ann serve orders to customers. The faster employees serve to customers, the more profits you will earn. At some point of time, Ann will tell you that a new server (employee) can be hired (check her conversations by tapping the book icon), but before that you will need to buy a service table first. Go to catalog >Furniture and purchase a service table. Next, you will need to hire a server. To do this, tap the menu icon at the top-right corner of the screen and press the server icon, which is located below the trophy icon. A new “Staff” screen will be displayed on your smartphone. Tap the “Hire” button. You will be taken to the “candidates” screen. From the list of candidates, choose a server that possesses better skills than the rest. Most servers will have upgraded skills. Also, make sure the server isn’t too pricey. Each server has a price tag, so you may hire the one whose price is the lowest of all servers. If you don’t like any servers from the list, you may choose to wait for an hour or so to get a new list of servers. The game updates the server list every few hours. You can make special recipes by adding special spices to drinks or other items. Such special recipes will fetch you over 100 bucks and some may even be higher than you can imagine. You can get spices as rewards for logging in daily or via daily gifts. To increase the number of daily gifts, upgrade your employee’s “Daily Gift” skill when he/she levels up. The more gifts you receive in a day, the higher the chances of getting rare spices. Spices can also be ordered via phone, but you will need to place one in your café. Unlock “Phone” at level 6. This will not only let you order spices, but also accept takeout orders, which means more revenue. Yippie! Some customers may also give spices. 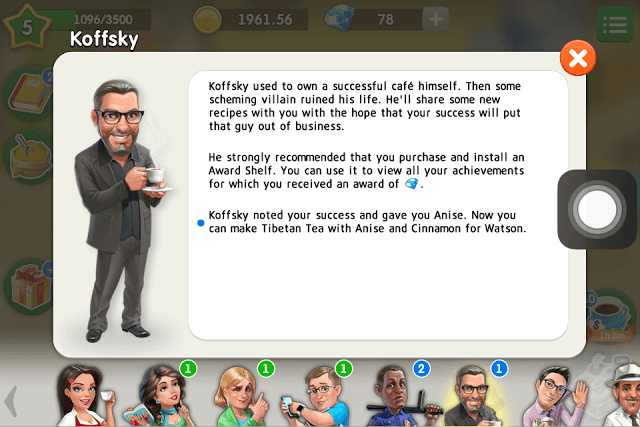 Keep chatting with customers and some generous and happy bloke, such as Koffsky, will give a rare spice. To get access to different types of rare spices, you will first need to build a stand and buy a Spice Box. Once you have bought one, you can collect spices that you have received from customers, phone orders or daily login rewards/gifts. Koffsky and Mary will give you spices and you can add them to tea or other drink and then serve the new item to customers. You can also purchase gifts from Fernando by trading them with gems. However, you will need to ask a customer whether they would like to have “something special”. They will suggest a special dish containing a spice of their choice and the amount they are willing to pay to you. If you those ingredients, including the special spice, then just prepare it for that customer. Tap the customer again to serve the special item to him. Adorning your café with eye-catchy furniture and decorations is a great way to earn bonus tips from customers. Your customers will give you hints on decorations and furniture, so pay attention to their conversations. For example: French style Latte Art painting can be nice addition to your café and will also earn you some extra tips. The bill will show how many dollars you have earned as tips for decorating your café in a certain style. The bill appears when you open the game. Decorating your café in one style will give you more tips. There are different styles such as Chinese, French, English and Classic. If you decorate your café with Chinese style furniture and decorations, then you will receive more tips than decorating your café with both Italian furniture and Chinese decorative pieces. 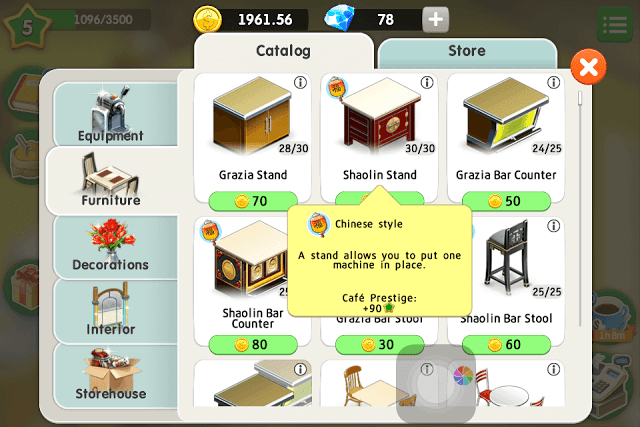 You can check which style a furniture or decoration belongs to by tapping the cash register icon at the bottom-right corner of the game screen. Select the “Furniture” tab and tap the tiny “i” (info) icon at the top-right corner of each furniture card. It will reveal the style (Chinese, English etc.) and the café prestige you will earn after placing it on your café. Tip: Furnishing your café in one style will earn you more tips than furnishing your café in two or three different styles. In case you have decorated your café with two different styles, you can discard furniture/decoration that belongs to one style in case you have unlocked more furniture/decoration that belongs to the second style to get more revenue. To discard, long press a furniture item or a decoration and a storehouse icon (cardboard box) will be shown. Tap the storehouse icon and that item will be moved to the storehouse. You can access that item anytime by tapping cash register. Select the “Store” tab and tap the “Storehouse” button. Every customer has its own story to tell, but there are a few helpful ones that will help Ann prepare new recipes and decorate her café with the choicest furniture to boost income and expand her café. Koffsky will share some new recipes and Margaret will give tips to decorate your café. Fernando, the chairman of the Café and Restaurant society, will provide hints to decorate your café and earn VIP points. Pay attention to what your customer says, tap him/her when a speech bubble appears to know what they want and they may reward you with a gem or two for meeting their requirements. Missed a conversation with a customer? No problem! You can access old and new conversations by tapping the book icon at the top-left corner of the screen. There you will see tiny portraits of your customers with numbers above them. Tap a customer’s portrait to find out his requirements, decoration/recipe tips or just plain gossip. Numbers with a blue background are actually unread or new conversations. Tap a customer’s icon to read all chats between Ann and her customers and the background will turn green, which means all conversations have been read by you. On the text screen you may find a tiny diamond icon at the end of a sentence as well as an arrow icon beside it. Such conversations actually quests and completing them will earn you a free gem. Check out our gameplay video to know what are the different types of gifts, what’s inside each gift and whether purchasing them would be a wise idea. It also shows that a player will earn more if she serves special dishes to customers. I don’t get any daily bonus too. I just started playing. Do you know what the point is for tables with 2 or 4 seats because everyone just sits there alone or is there going to be “couples” further on in the game? Yes even I have noticed that everyone sits there alone, but I don’t think they are meant for couples. Developers should introduce couples in the game, but I don’t think My Cafe has this feature right now. What’s the difference between the same machine with different prices? What’s the cafe prestige for? Cafe prestige is denoted by star(s). You earn them to level up. The circle around the star on the upper-left corner of the screen shows how many prestige points you have earned so far and the star shows your current level. When the circle fills up, you level up. The more prestige points you earn by placing equipment and interiors, the faster you will reach a level. You also receive prestige points when you serve food and beverages to customers. When you level up you can unlock certain equipment and interiors. For example, you will unlock the “Tartlet Display Case” when you reach level 7. There is a small difference between machines. For example, you will get vanilla ice cream from the “vanilla ice cream freezer”, and strawberry ice cream from the “strawberry ice cream freezer”. You must place both in your restaurant as one customer may demand vanilla ice cream and the other may demand a strawberry ice cream. Is there any way to obtain more slots in my spice box without spending diamonds? You will have to spend diamonds to open more slots in a spice box. What does it mean when receive is missing and how do I get it back? Do you mean “profits lost”? Love this game! Just wish it was not so between the car and truck type games. It is quite annoying being stacked. I need cardamom for long and I never receive it. The game is very nice but never received special reward, which is boring. I need cardamon for two customers and I don’t believe I am going to get it. When I serve special order to customers, they give me ticket. Where’s the ticket? Can someone help me? 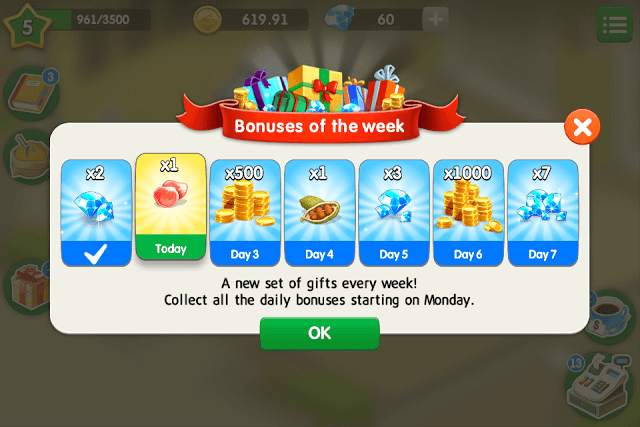 You can use tickets to open the Daily Bonus boxes. Tap menu on the upper-right corner of the screen and then tap the Daily Bonus icon to access it. Tap “Play” for free if you haven’t played yet. Next, watch a video to play one more time. Finally, you will see a “play for 1 ticket” button. Since you have tickets received from customers, you can use them to open the remaining boxes. You can use one ticket at a time. You can do this several times until you use up all tickets. I am stuck at level 20 and in need of money to buy Coconut. It’s been months now and I cant seem to generate enough money to but this item. I have tried increasing my tips, but that is not working. Any tips or ideas? You can upgrade Ann’s special skill called “All Items” Price to raise the price of all items in your menu. If you upgrade this skill to level 5 you will be able to raise the prices of all items by 20% and at level 10, prices of all items will be raised by 30 percent. Make sure you have enough diamonds to upgrade Ann’s special skill. Don’t forget to take phone orders to earn extra cash. Assign a server to take a phone order. You will receive coins and spices. Tap the phone icon on the right side of the screen. Make sure you fulfill special orders from customers that usually involve spices. Tap a customer and then tap “Would you like something special”. Special orders fetch more money. How do you change the color of the furniture? AFAIK you can change the style of furniture at level 7. Talk to “Fernando”. How do you get the iced tea? Have the ice machine but do not know what else to do. I am currently on level 17. With Ann level 5 stuck at 299/1000. What am i gonna do? It is Almost at 2 month.. Pls help! Let Ann take orders to gain XP. She will take orders and serve your customers. When a coin icon appears above her, just tap her and XP will be credited to her profile. You can confirm this by tapping the menu icon on the top-right corner of the screen > staff and then tapping “Barista” to see whether she gained an XP or not. Hi. I have no diamonds left and am struggling to make drinks. Has only a couple of spices. I just wanted to know how to get diamonds while making drinks? Does anyone know? Thank you. This game is so addictive. I love it! Sometimes, I earn special decorations, but they don’t seem to add prestige. Is there any benefit to them, or is it ok to sell them? Just check if they belong to a particular theme or style (English, Chinese etc.,) and maybe placing them along with other furniture increases tip? I will leave this to the readers and if someone has earned a special decoration, maybe he/she will be in a better position to answer your question. Tap interiors and then tap “English Style” and then start placing English Style furniture to get extra 0.90% in tips. It’s the ambience that gives you extra tips: English – 0.90%, French – 1.08%, American – 1.33%, Chinese – 2.73% and so on. Edit: I personally don’t think it is possible to find out which particular item gives tip. It all depends on which style you are using and whether you have placed all furniture belonging to that particular style/theme. I asked one of my friends and she is on level 15 and she is using English theme. She is earning around 13% extra in tips. To get higher percentage, just make sure that everything, from equipment to furniture to decor is of the same style. Just don’t mix two different styles. Also, the more pricey a furniture is, the more tip you earn (debatable?). I’ve had this game before, and had no trouble. I redownloaded it and now the game won’t let me pick up two items at once, as I am trying to make english tea and cannot pick up the tea and milk. Any suggestions? I took a phone order from my town. My staff filled 2 of the ordered items but are not processing the 3rd one, which is a simple cup of tea with rose petals. I tried exiting the game and logging in again but this hasn’t helped. Neither has re-starting my tablet. Is this a glitch in the game and will this order forever be on my phone order list? You have to place the special orders by yourself. The staff can’t make special drinks. I am at level 19. I am not receiving any stories from customers. Is there no story in level 19? How should I level up sooner? I just purchased another town. What to do now? How can I change the style of the special items that they are offering in the daily special offer? It will change on its own if the majority of the style is more than the previous one. I was also wondering until I did it and it changed. Hope I helped. Why do I only receive balloons and not coins,. I receive useless balloons when I serve special spice to customers. I would like to know what happens when a server is maxed out? Are they going to level up anymore or should I get another server? Do I have to buy everything what customers suggest me? If you want to get the rewards (gifts or diamonds), then yes! Is there any way to send someone gifts or spices? And then get things from them too? No, there isn’t any way to gift spices or receive gifts from your friends. The game lets you connect to Facebook so that you can save your progress and play the same game across all devices. That’s it! At first I also thought that connecting your game to Facebook will let you send and receive gifts from Facebook friends, but currently this feature is not there. Hello guys, I bought most of the French style machines like tea machine, Americano machine etc. Do I have to keep the original bought ones? Or can I sell them to Carl? Since I did that with the freezer and then found it to be bought again for some coins, so is it a must to have the original ones? No, I don’t think so. You can sell them if you want. No, you don’t have to keep them. Though I have seen cafes that are using both. I think, in that position, I would store the originals and bring them out when my cafe gets bigger. Do the wardrobe changes in a specific style help increase tips also? Haven’t noticed any such increase in case of wardrobe changes in a style. Can we find out what is inside “Daily Gifts” without opening them? If you mean Ann’s Daily Simple Gift or Gifts received from customers, then I don’t think there’s any way to know what’s inside them. You will need to drag a gift onto the green circle to find out what is inside. However, If you are thinking of buying a gift (Gold, Blue or Pink Gift), then you can easily know what items can be found in the box. Tap the gift box icon and then tap the tiny blue “i” icon above each gift and it will show a list of items that the box might contain. You will also get gems and VIP points. Thanks for responding. But I am talking about the 9 red cans (with white strips) that we have to open using tickets or by playing video. Ah Daily Bonus. Unfortunately, there isn’t any way to know what’s inside those cans. You will need to tap one of the nine cans to open it. I don’t get any daily bonus. What is this?